At least 21 people have been killed and more than 70 injured in Egypt in a suspected suicide bombing outside a church in Alexandria as worshippers left a new year service. It was initially thought a car bomb had caused the explosion just after midnight at the Coptic orthodox al-Qidiseen church. But the interior ministry suggested a foreign-backed suicide bomber may have been responsible. The blast did not originate in any of the cars that were destroyed, a ministry statement said. "It is likely that the device which exploded was carried by a suicide bomber who died among others." The circumstances of the attack "clearly indicates that foreign elements undertook planning and execution", the statement said. 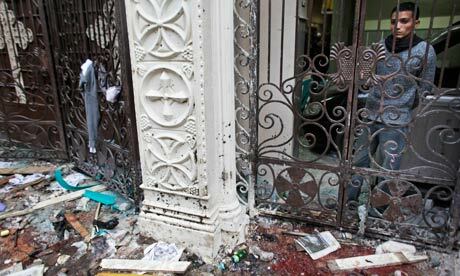 The governor of Alexandria, Adel Labib, accused al-Qaida of planning the bombing. "The al-Qaida organisation threatened to attack churches inside Egypt. This has nothing to do with sectarianism," he told state television. His assessment was shared by Kameel Sadeeq of the city's Coptic Christian council. "People went in to church to pray to God but ended up as scattered limbs," he told Reuters. "This massacre has al-Qaida written all over, the same pattern al-Qaida has adopted in other countries." Senior health ministry official Osama Abdel-Moneim said the death toll stood at 21 – a figure also reported by the state media – and at least 79 had been wounded. Health minister Hatem el-Gabaly told the Reuters news agency that 17 people had been confirmed dead, 12 of them identified as Christians. Five bodies had yet to be identified, he added. "The last thing I heard was a powerful explosion and then my ears went deaf," Marco Boutros, a 17-year-old survivor, said from his hospital bed. "All I could see were body parts scattered all over legs and bits of flesh." Following the blast, hundreds of Christians took to the streets, clashing with police and Muslims. Some Christians and Muslims pelted each other with rocks after a mosque was reportedly targeted. Police used tear gas to disperse the crowds. The Reuters news agency reported that some of the protesting Christians had shouted: "We sacrifice our souls and blood for the cross." The interior ministry said the blast also damaged a mosque near the church and eight Muslims were among the wounded. Nearly 1,000 Christians attended the mass at the church, according to a priest, Father Mena Adel. "I was inside the church and heard a huge explosion," he said. "People's bodies were in flames." "This is a scene from Baghdad," said another witness. People reported seeing the charred chassis of a destroyed car, with the remains of several bodies nearby and dozens wounded. President Hosni Mubarak went on state TV and vowed to track down those behind the attack, pledging "we will cut off the hands of terrorists and those plotting against Egypt's security". He added that the bombing was an attack on "all Egypt" and that "terrorism does not distinguish between Copt and Muslim". Christians make up about 10% of Egypt's population of 79 million. Security around churches has been stepped up in recent months with the authorities banning cars from parking directly outside them, after an al-Qaida-linked group in Iraq threatened the Egyptian church in November. The Islamic State of Iraq, which claimed responsibility for an attack on a church in Baghdad in November, threatened the Egyptian church over its treatment of women who the Islamist group claimed were being held after they had converted to Islam. In November, hundreds of Christians rioted in the capital, Cairo, smashing cars and windows after police stopped the construction of a church.